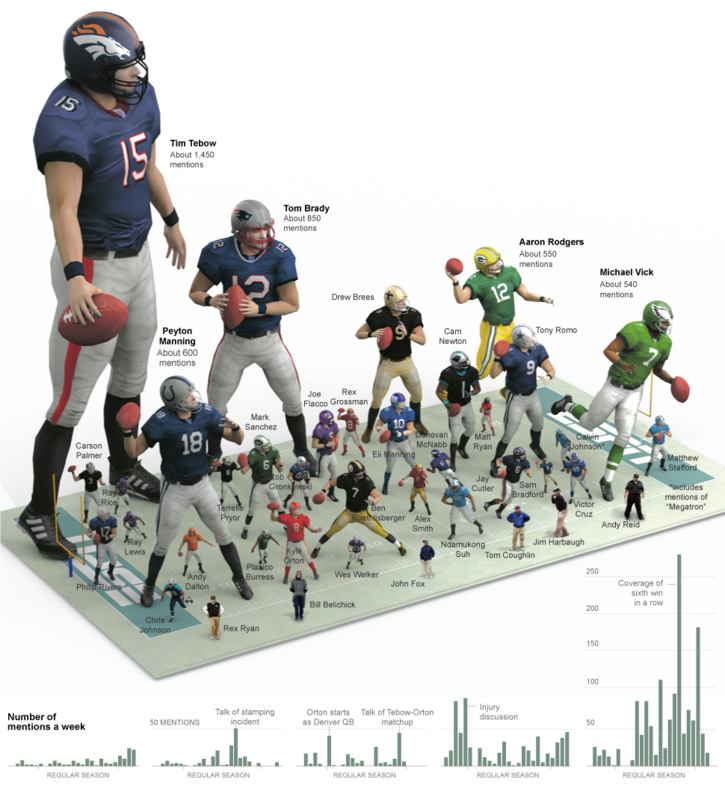 Would Manning Be Taller Than Tebow This Week? I guess this is old… but I just saw it on reddit. The graph of who gets the most mentions on SportsCenter. It’s described: “Transcripts were collected from the 9 a.m. and 11 p.m. editions of “SportsCenter” from Aug. 1, 2011, to Feb. 1, 2012, including the weekly broadcast of “Sunday N.F.L. Countdown” on Sundays. In some cases, a later airing was used to avoid conflicts with “College Gameday” on Saturdays. Closed-captioning transcripts for a small number of dates were not available.” Cool. But what I want to know is how much bigger Peyton will get… and how much smaller Tebow will get… now that they’re both in Denver. Or could the legend of Tebow still grow? Look at poor little Philip Rivers too… barely bigger than Tebow’s shoelaces. This entry was posted in Football, NFL and tagged ESPN, Peyton Manning, sportscenter, tebow. Bookmark the permalink.